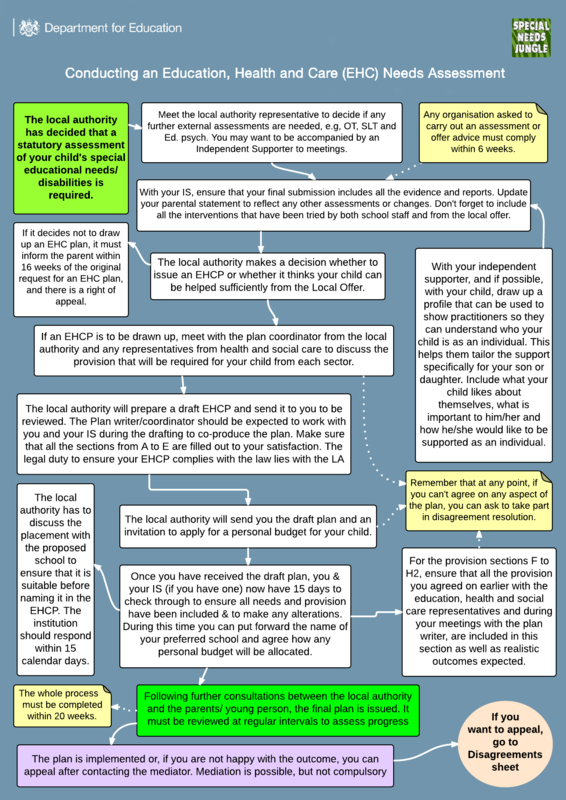 You've applied for an assessment for your child's special educational needs and lo! you get the go ahead from the local authority. What happens next? If your son or daughter already has a statement, they will be moved over gradually, depending on your local authority, most probably at the next transition point. You may have a reassessment, but the DfE and the SEN Minister, Edward Timpson is adamant that NO ONE should lose their SEN statutory protection as a result of the new system's changeover. Any LA seeking to move over every statemented child in a year is just asking for a mess to ensue, IMHO. If they are 16 and moving to further education, moving them to an EHCP is a priority says the DfE, as presumably is moving those just going into Year 11. Son2's Y11 Annual Review is in October and Son1 is starting 6th form college, so watch this space - we'll go through it together and this will be part of the basis of my next book about the new process. And before we get to the Flow Chart, I need to remind everyone that this is a HEADLINE chart - you won't find the detail here, just the flow of the stages. At ANY stage of the process - even during the earlier stages of SEN, you can call in the services of Dispute Resolution if you don't agree with your child's SEN help, I am told. Not sure where you will find these people as yet, but your LA hopefully should know. We haven't yet done an Early Support flow chart, but are working on it. If you'd like some input into it, please contact me, co-production is welcome! Okay, so the chart is below. If you spot anything wrong, email me. I've had a fresh set of eyes very kindly check it over for me, as all writers will know how many times those close to it can miss the same typo! The PDF with white background is linked underneath. *until August 31st, you can still apply for a statement of SEN.
Never forget that all of us at SNJ are parents of children with special needs and disabilities or have worked extensively with families affected by SEND. Debs, Ange and & I, as well as columnists Hayley and Renata, are experts at being parents of children with SEND, just like you are, but we are not lawyers*, health professionals, politicians or teachers. Our advice is based on experience and informed common sense, as well as a deep desire to help other parents gain the confidence, information and skills to be able to advocate for their own families. We are about empowerment and hope that these flow charts help you start to get to grips with the new system when the time comes for you to experience it. It’s going to be interesting to hear people’s experiences of how this works out once things get going. More meetings, communication and co-production between parents and LA. To a certain extent it’s business as usual for parents with gathering reports, evidence, putting their case together etc. but very different and no doubt a shock to the system for LAs as they will be needing to meet with parents and discuss things a lot more than they are used to. I do hope LAs really enter into the spirit of co-production, I guess there’s a risk they may hold meetings with parents then tick the box and move on and continue with their own thing as they used to do. My experience of the old system was that it was only once you were well into the appeal stage that LAs started to take notice and have discussions with parents, thus delaying providing the child with an appropriate(/any) education for as long as possible – let’s hope this is all about to change. Yes, let’s hope! And as the need for it is in black and white in the CoP, it better had happen!